The naturally perfumed breezes of the French countryside are just what you will get with this fragrance. Lavender has been known to be great for relaxation and calmness. 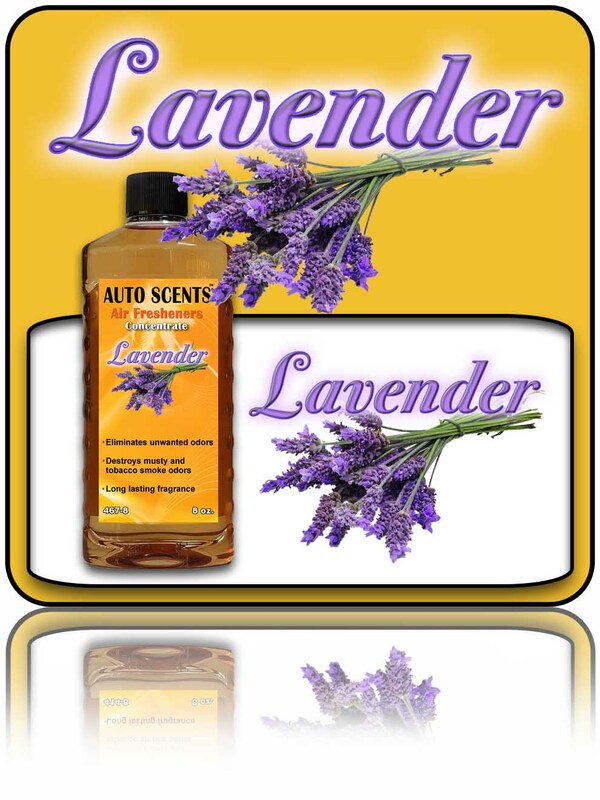 Auto Scents Air Freshener Concentrate makes up to two gallons of powerful long lasting fragrance spray. Removes stale or musty odors and improves air quality in vehicles, recreational vehicles, offices and homes. Useful in full-service car washes, detail shops, new car dealerships, used car dealers, RV dealerships and rental car agencies. California Orange Air Freshener Concentrate 8 oz. Coconut Creme Air Freshener Concentrate 8 oz. Sapphire Ice Air Freshener Concentrate 8 oz. Creamsicle Air Freshener Concentrate 8 oz. Cucumber Melon Air Freshener Concentrate 8 oz. Copyright Auto Scents Inc.. All Rights Reserved.